By your registration you receive further additional functions! FGS Cashbook is a multilingual financial software, which can process all currencies! 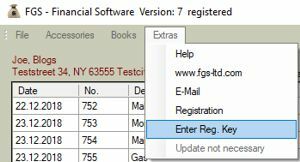 By your registration you receive other additional functions: Evaluations, paging functions, change cash box name (kind of book), password protection, copy function (several books administer) and export to Excel, Access or text file. Registration will cost 24,99 US $, you receive afterwards from us a registration key with which all all the additional functions automatically be activated. * On all payments the current day exchange rate (US $ to your currency) is used. Some countries may still arise in addition to VAT. Please note the following important information! For the creation of your personal key we use Name 1, Name 2, street with housenumber and also postal zip code with city. Pay attention please to upper case and lower case as well as to blank character! Enter the same address data which you see on this form "Extras > Reg. Key. Order". You are requested to the input of the name 1 and 2 with the registration specially again. "Extras > Enter Reg. Key"
Then you have all the additional features available!